Sh 2-35 and Sh 2-37 are part of a 130 thousand solar mass giant molecular cloud. Sh 2-35 appears along the western edge of this cloud. Sharpless connects this nebula to a number of stars, the hottest of which is the B0 IVPE star HD 312973, which Humphreys locates in the Sgr OB7 association. SIMBAD reports that HD 312973 is actually an O-class star. The RCW catalog describes this as a 2x2 arcminute medium bright object that is "Stellar in appearance". There is no visible nebulosity at this location in SuperCOSMOS and no references in the scientific literature beyond the catalog itself. It seems likely that this nebula does not exist. RCW 153 is a faint nebular ring that includes the much brighter Gum 78 (Sh 2-37 / RCW 153a). Sh 2-37 lies in the direction of the ionising star cluster Dias 5. It is also known as IC 1283/1284 and the powerful radio source W 34. Sh 2-35 and Sh 2-37 are associated with a 130 thousand solar mass giant molecular cloud and appear to be part of the Sgr OB7 association. 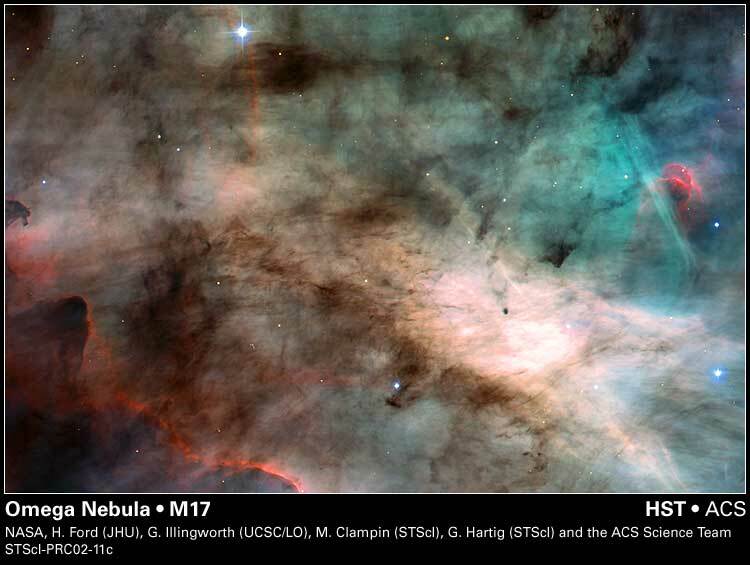 Sh 2-37 is visible through a hole in this molecular cloud. This is a very active star formation region. You can find an infrared image of part of this region here, full colour images here and here, and an analysis of the correct names for these objects here. This faint diffuse nebula is visible in SuperCOSMOS surrounding the B0 III multiple giant LS 4659, which is the ionising star according to Vogt and Moffat. Sh 2-40 appears as several bright knots of nebulosity extending above the much larger nebula Sh 2-41. Avedisova suggests that Sh 2-40 is ionised by the B-class star LSS 4756. The RCW catalog lists the bit of Sh 2-40 that is furthest from the galactic plane as RCW 155a and the brighter bits closer to the galactic plane as RCW 155b. RCW 155a consists of the larger and dimmer nebular knot within RCW 155 that lies further from the galactic plane. RCW 155b consists of the three brighter nebular knots of RCW 155 that lie closer to the galactic plane. This faint diffuse nebula is close in direction to the suspected supernova remnant GAL 013.1-00.5 and appears to be located in an empty region bordered by the OB regions Sgr OB1, Sgr OB7 and Sct OB3. Avedisova places Sh 2-43 / RCW 156 into star formation region SFR 13.62-0.76 along with two infrared sources and many molecular clouds. No ionising star for Sh 2-43 has been identified in the scientific literature and no ionising star in this direction appears in the Reed catalog or SIMBAD either. The bright star in this image is the K2 III giant HD 167720. This is a slightly brighter region within the diffuse nebula RCW 156. The bright star in this image is the K2 III giant HD 167720. This huge almost circular nebula is very prominent in hydrogen-alpha as can be seen in this SuperCOSMOS image. Avedisova concludes that it is ionised by the O6 V star HD 167633. Humphreys places this star in the Ser OB1 association in the Sagittarius arm. However, several other sources give larger distance estimates, placing this nebula in the Centaurus arm, where it may be part of the Scutum supershell. This isolated nebula is located well above the galactic plane. Avedisova concludes that it is ionised by the potential runaway O9.5 Iab supergiant HD 165319, which may have been ejected from NGC 6611, the central star cluster of M 16, the Eagle nebula, about 1.8 million years ago. Papers published in 2008 and 2011 show that the hydrogen-alpha emission matches the radio emission from the supernova remnant closely, providing strong evidence that RCW 159 is identical to SNR 015.1-01.6. Oddly, none of the researchers who published these papers appear to have realised that the hydrogen-alpha nebula they were studying was already catalogued as RCW 159!